Fox News is standing by host Sean Hannity amid an advertiser boycott campaign. Sunday’s statement was the first time that Fox News has commented on the boycott effort. “Sean Hannity hosts the number one program in cable news because millions of Americans make the decision to join him every night and the audience relationship is stronger than ever,” said a Fox News spokesperson. When asked specifically about advertisers, however, the network would not comment. A smattering of companies have publicly said that they’re avoiding Hannity’s show. But so far there hasn’t been a repeat of the advertiser exodus that was seen last April when companies abandoned Bill O’Reilly’s show en masse. Media Matters has long railed against Fox News and Hannity in particular. But the feud between the two has grown increasingly tense in recent weeks. The organization first called for a boycott in August, and it upped the pressure after Hannity stood by Alabama senatorial candidate Roy Moore. Moore last week penned an open letter to Hannity after the host called on him to explain inconsistencies in how he addressed the allegations. Hannity read the entire letter on his show and said that the election should be decided by Alabama voters. Hannity sent five identical tweets that all linked to a website that claimed to “expose” Carusone as a “racist” and “anti-gay” person who shames victims of sexual abuse. “RACIST, BIGOT, AND ANTI-SEMITE PRES. OF @MMFA @GOANGELO WHY DO YOU VICTIM SHAME? WHY DON’T YOU SUPPORT WOMEN OF ABUSE? @CNN @BRIANSTELTER WHY DO YOU SUPPORT THIS?” the tweets read. 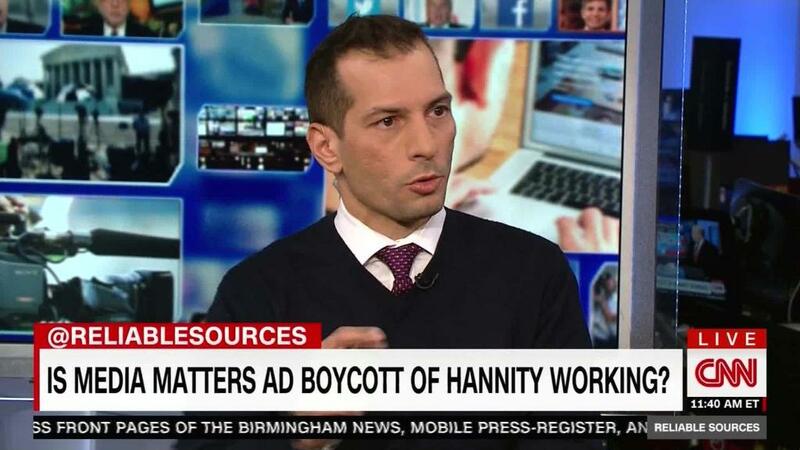 Carusone told Stelter that Media Matters has heard from dozens of companies after it began calling for a boycott. CNN could not independently confirm this claim. “And then there are many more companies that never started in the first place, because they say this is too volatile, there’s too much potential controversy associated with it,” Carusone said. Carusone said he is generally opposed to ad boycott efforts, even though he is currently leading one. He explained his reasons for going after advertisers, asserting that Fox News does not hold Hannity accountable for the “kinds of destructive and reckless things” he does. “When you’re faced with an entity that doesn’t have any accountability, you have two choices — do nothing and continue to endure the destructive consequences of it or appeal to a higher power. In this case, it’s the advertisers,” he said. –CNN’s Brian Stelter contributed to this report.